Q²M LeatherCleaner Mild is an gentle yet effective pre-coating leather cleaner. Developed along with Gyeon’s high-end Q² LeatherShield, it is the ultimate leather preparation product for use before a coating application. It removes light dirt, oily residue and even light discolouration. Unlike most leather cleaners, the formula does not include any softening or preserving additives, leaving a surface ready for coating. Q²M LeatherCleaner Mild is the perfect solution for daily maintenance and pre-coating preparation of leather upholstery. It does not contain any softening additives and does not leave any residue that could potentially interfere with a quality quartz coating. 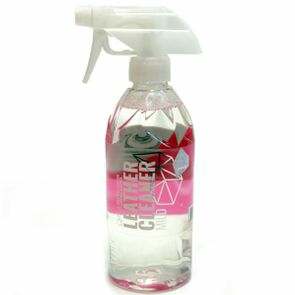 Q²M LeatherCleaner Mild leaves a fully matte finish and is suitable for all modern types of leather. It might be used on coated leather too, not removing the coating and gently cleansing the surface. Always vacuum the upholstery first. Use Q²M LeatherCleaner Strong along with water, to increase the foam and help distributing the cleaner. Use the Q²M LeatherBrush, working in sections. Pro Tip: TIP: Always remove dirt with a microfiber in straight motion. Use at least 3 towels: for the initial wipe, a damp one to remove suds and another one to dry the surface.